Watch for the 2019 Harrisionville Telephone Company Directory Coming Soon! Watch for the 2019 HTC Directory Coming Soon! Have you been curious which local businesses would be featured on the cover of the 2019 phone directory? You’re in luck. The 2019 HTC Directory is on its way and will be arriving in your mailbox in the next several weeks and in it you’ll find the most current and up-to-date contact information for residents and businesses in the communities we are proud to call home! In the HTC Directory, we’ve listed home phone numbers for your fellow HTC customers, making it easy for you to contact friends, family, neighbors, former high school classmates, and even your yoga buddies from the Y. Whether you need to find the number for a local business in town or you want to order from a local takeout restaurant, we’ve included phone numbers and addresses for businesses in Columbia, Dupo, Prairie du Rocher, Red Bud, Renault, Valmeyer, Maeystown, Waterloo, and even Hecker, Millstadt and Westview. 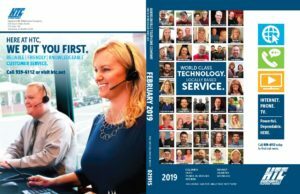 For the 2019 directory we are once again proud to feature over 35 local, happy, satisfied customers who count on the services HTC offers including Internet, TV and Phone. We are proud of our 85+ employees who live, work and serve the companies in our great communities. We are hometown proud and pleased to spotlight local businesses that make up the fabric of our hometowns. So, when you get your new 2019 HTC Directory, be sure to look at all those featured on the cover. And, when you see them around town, let them know that you too are a proud HTC customer! Harrisonville Telephone Company is a provider of reliable, cost-effective Internet (for streaming, gaming, surfing, viewing, listening, downloading, and more), television (hundreds of channels, free HD, VOD access and more), and phone (unlimited local and long distance, voicemail, caller ID, etc.). Want to learn more about our great home or business bundles? Visit our website, call us at 939-6112, or fill out our Contact Us page. We look forward to hearing from you.